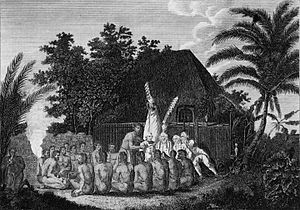 Captain Cook’s third and last voyage was, as announced publicly, to return Omai to Tahiti. The real (and secret) mission of the voyage was to look for the fabled Northwest Passage. Cook left in 1776, with Omai, who had returned to England with Captain Cook on the earlier voyage. Omai was quite the celebrity in London during his visit to England. After returning Omai to Tahiti, Cook turned north becoming the first European to visit the Hawaiian Islands. Cook named the islands the Sandwich Islands after the Earl of Sandwich (at the time the Earl was the acting First Lord of the Admiralty). After leaving Hawaii Cook next made landfall on what is today the Oregon coast at approximately 44°30’ north. Cook named this area Cape Foulweather because of the foul weather he encountered there. Something he failed to discover was the Strait of Juan de Fuca. Then he sailed on to Vancouver Island where Cook spent a month trading with the natives on the island. From there, Cook sailed to the Bering Strait. Though he tried several times, Cook failed to sail through the straits. He did discover yet another inlet in Alaska, which is known as Cook Inlet. Most important, Cook filled in the blanks on nautical charts that existed between Spanish California and Russian Alaska. 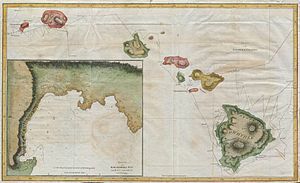 Cook next turned south, arriving in Hawaii in 1779. Cook stayed in Hawaii for a month. Then just as they were to leave, a skirmish took place between the Hawaiians and Cook’s men. During this skirmish, Captain Cook was killed (I will write about this in the fourth and final Cook article). Charles Clerke took over the expedition and made yet another failed attempt to get through the Bering Straits. Clerke then died, and Captains John Gore and James King took over command of the HMS Resolution (Cook’s ship) and HMS Discovery (Clerke’s ship). In October 1780, the ships began their return voyage to England. During the return voyage, Captain King finished Captain Cook’s account of the third voyage. Captain Cook had been sent, on three voyages, to discover a non-existent continent, and a sea passage that would not be discovered for another 150 years (and is impossible to sail through most of the year). Both of these were believed, by the best scientific minds of the day, to exist. Instead, Cook made more scientific discoveries than any explorer, while creating charts that, due to their accuracy, are still in use 250 years later. No small feat when you considered the crude (by modern standards) instruments he used. Just think what he could have done if he would have had GPS. Though he began life as the unknown son of an unknown merchant, when he died at age 51, he was arguably the greatest explorer Europe ever produced. Can you do a post in my great great grandfather Jean Baptiste Bessiere – Duke of Istria? That would be amazing. That would be amazing Joe. Of course I never knew him but my family stayed in the area after the revolution. He was best friend to Napoleon and died in England by a cannon shot. He was French and a doctor before he went into the army. I course take your time my precious. I just think its awesome that you would write about him. As usual, your history is much better than my history!